Make gemology for kids educational and fun with these gemstone-themed games and activities. Print this entire article or just the games you want. The colors and play of light on faceted gems are appealing to young and old alike. Little gemologists will enjoy trying to capture these dazzling effects with crayons. Show them how faceted gems aren’t always a single color but can show many shades and flashes of light instead. 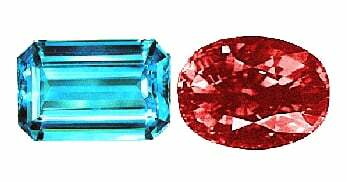 Print as many of these outlines as you like and let kids color these stones as if they were purple amethyst, light blue aquamarine, green emerald, dark blue sapphire, and red ruby. 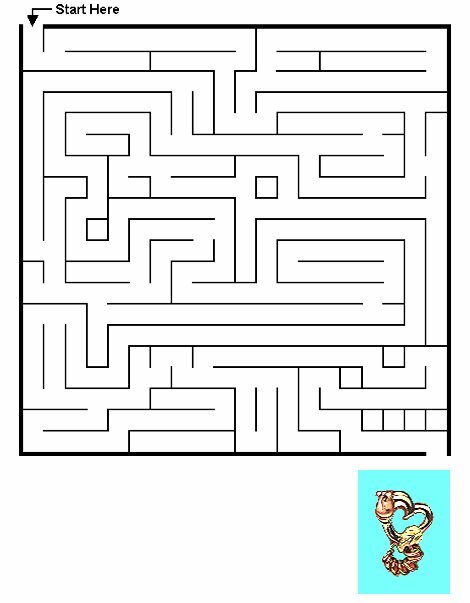 Gemology For Kids: Mom Lost Her Earring! Encourage your budding jeweler to examine your favorite pieces carefully. After working hard all day, Mom lost her earring. Can you backtrack to where she lost it? 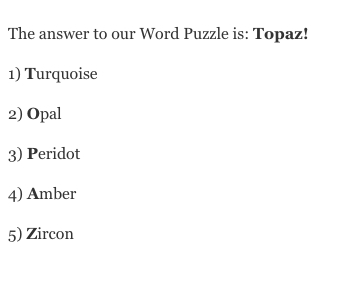 These puzzles are perfect for challenging kids who are taking a more serious interest in gemology. Let them use the International Gem Society website or another gemology reference work to help them figure out these clues. Fill in the answers to the clues in the spaces provided. 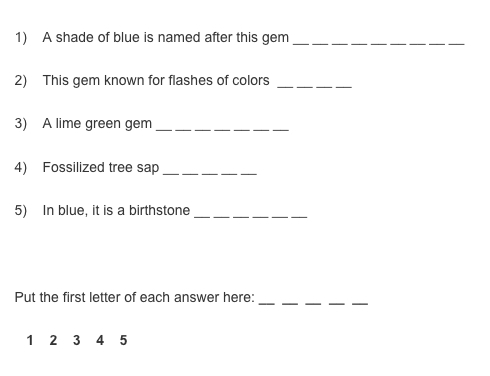 The first letter of each answer spells out the name of a well-known gemstone. Click here for the answer. For a fun activity for a group of children, try this party game created by Giovanna. You can set the amount of playing time, starting money, the prices for mines and tools, the value of the chocolate chips, and penalty fees you think are appropriate for your group. Chocolate chip mining is a hoot. It’s a contest that teaches kids how a mine operates and functions on an economic level. Everyone starts with an equal amount of play money that they use to “buy” a mine and tools. The mines consist of a variety of chocolate chip cookies. The idea is to buy a mine, or cookie, with as many gems, or chocolate chips, as possible. Of course, some brands cost more than others. Players also purchase their mining tools, various things to dig into the cookies like toothpicks, unbent paperclips, etc.. These also have different prices. Now the fun begins. The players trace the outlines of their cookies on a napkin or paper plate. When the signal is given, they carve out of their cookie as many of the chocolate chips as possible. (Some kids dig out individual chips. Others just pulverize the cookie). When the signal is given to stop mining, all the cookie crumbs (not the chocolate chips) must be inside the original cookie outline (as per EPA requirements ;^). Stray crumbs will cost the mine operator! Next, each player weighs their chocolate chips on a gram scale and is paid money according to the weight of the chips, minus any penalty fees for stray crumbs. Of course, the player with the most money wins. Join the thousands of IGS members.